Max, my 8 year old food critic, declared this dinner as “The best dinner you have ever made me”. As for myself, I would not say it is the best thing I have ever made…but it was darn good. I think that any time you cook with ingredients that are in season and at their prime, your food will just taste really good. 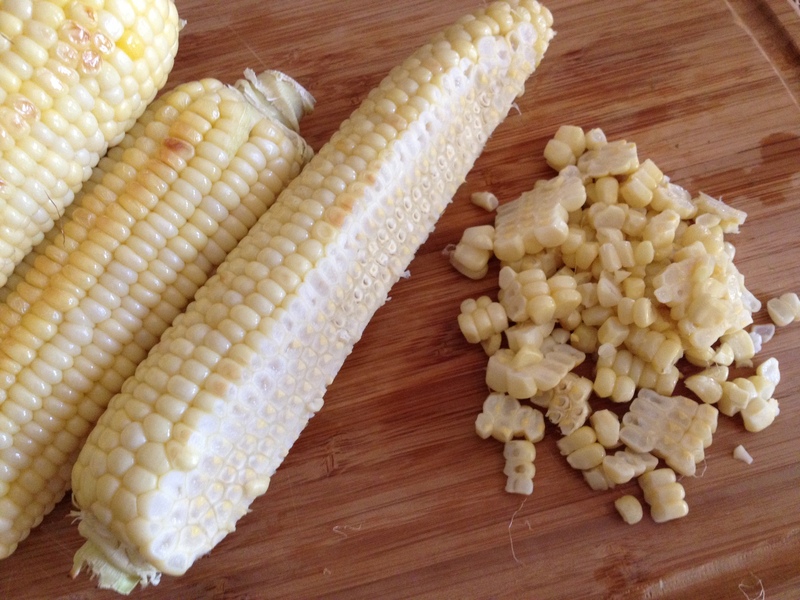 Wild salmon is readily available right now and summer corn is delicious and sweet. California avocados are at the market and seem to be ripe whenever you need them. As for tomatoes…well…that’s sort of a sore subject around here. My husband has been working really hard on his tomato garden and so far we have only had a few available to eat. Any day now…I’m sure there will be a windfall of tomatoes and I will be scrambling for recipe ideas. For right now, I had a small handful of these amazingly sweet cherry tomatoes that came from our garden, and the rest came from the grocery store. The hubby is usually in charge of grilling salmon around here, but with him at work I decided to go with the oven. I’m not much of a griller. You could definitely go that route though if you are good with the grill. The glaze I put on was really delicious. Maybe that’s why my boys loved it so much. For as many steps as there are to this dinner, I found that it came together pretty quickly and easily. You could do some of it ahead of time too, which would come in handy if you were cooking for company…and this is definitely company-worthy! 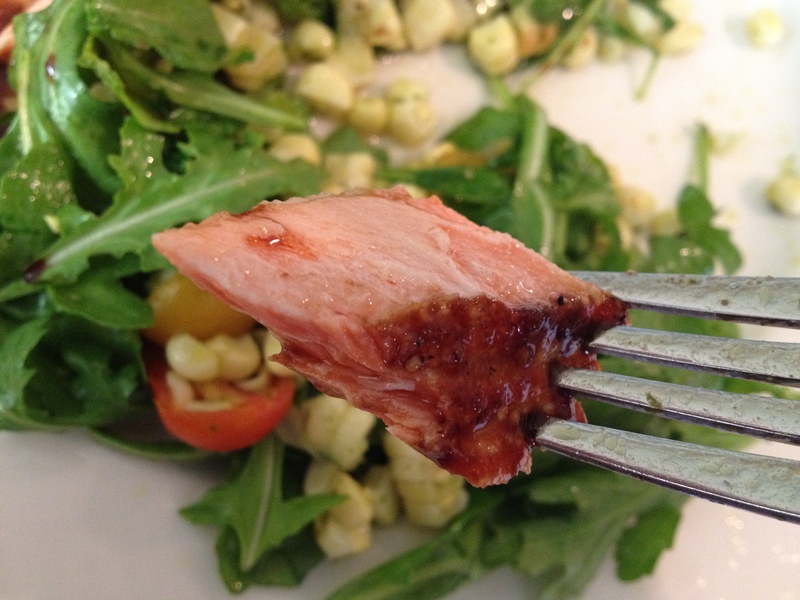 The glaze for the salmon and the dressing for the salad could be done in advance as well as prepping the corn. In a small sauce pan, whisk together the vinegar, maple syrup, mustard and garlic over medium heat. Bring to a boil then reduce the heat to a simmer and cook until thick, about 12 minutes. Set aside to cool while you cook the salmon. Put your oven rack in the center of the oven and pre-heat to 425. Cover a large cookie sheet with parchment paper. Rinse and pat salmon dry. 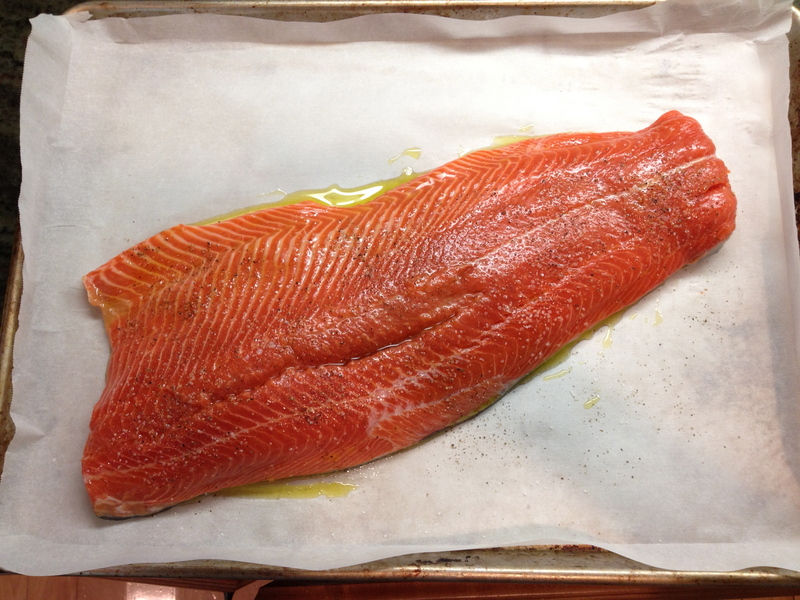 Lay skin side down on the parchment and coat with olive oil. Season with salt and pepper. Roast for about 10-15 minutes. Mine took 15 and was cooked perfectly. 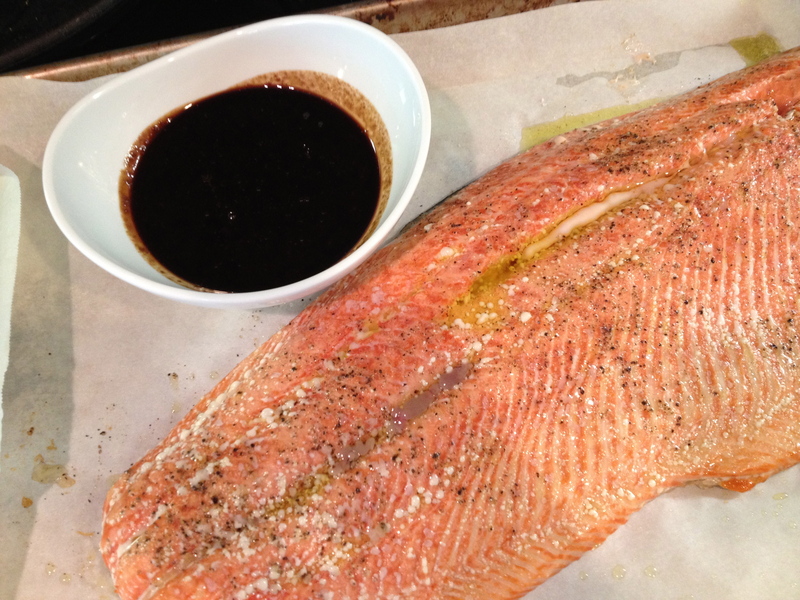 Remove from the oven and drizzle some of the glaze over the salmon. Cover with foil and rest for 5 minutes. Combine the vinegar, basil, sugar, 1/2 teaspoon of salt, 1/4 teaspoon of pepper and oil in a blender or small food processor and blend until smooth. Can be made in advance and refrigerated. Bring to room temperature before using. 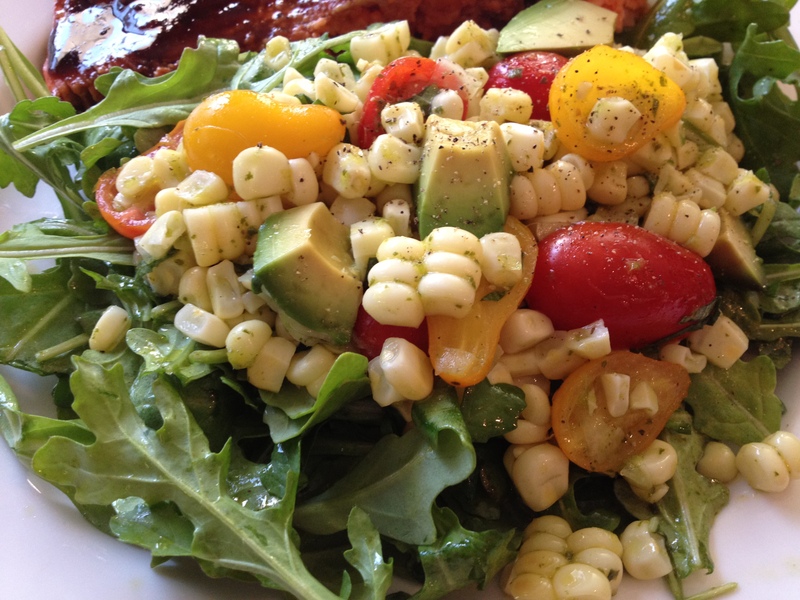 Cut the corn from the cob and combine with the onion, tomatoes and avocado in a large bowl. Add 1/2 of the dressing and toss to coat, season with a little more salt and pepper. This can sit at room temp for up to 30 minutes before serving. The flavors get even better as it sits. Toss the remaining basil dressing with 4 cups of arugula. 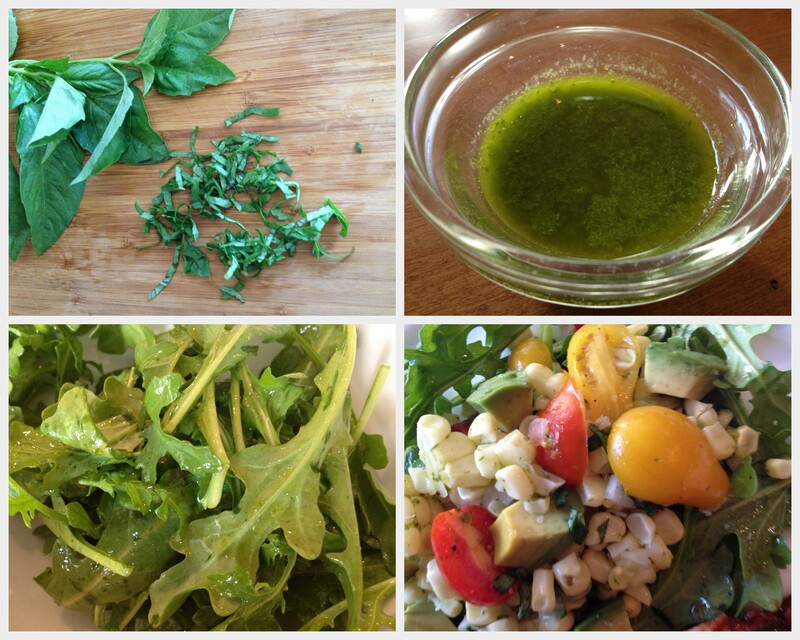 Divide the arugula onto plates and top with some of the corn salad, garnishing with the sliced basil. 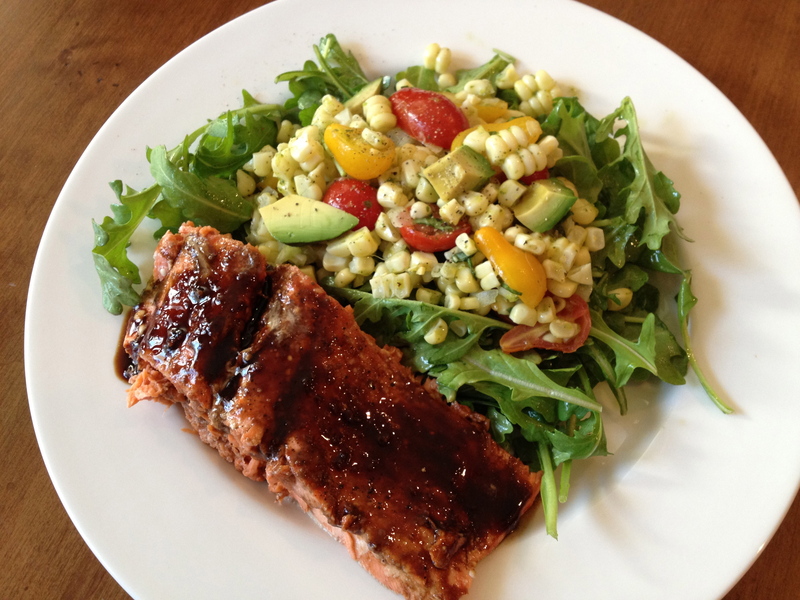 Cut the salmon into 4 filets and put next to the salad. Drizzle more of the Balsamic-Soy Glaze over the salmon. Serve immediately. Now that’s a Juicy Bite! I CANNOT WAIT to make this one!